This section is targetted at explaining how to use the debugger. 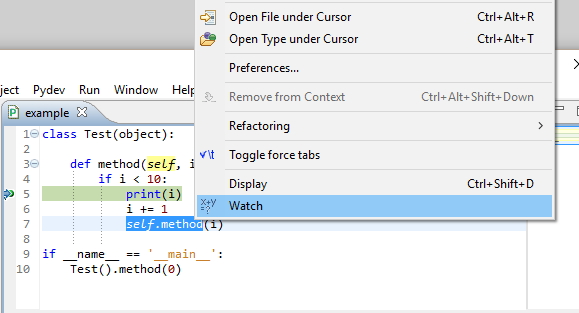 If you want more details on how to use the remote debugger, please check the Remote Debugger page. Use Ctrl+Shift+B to toggle the breakpoint in the line (if it doesn't work, go to the customize perspective and enable Breakpoints in Action Set Availability. If everything goes ok, you'll have the breakpoint shown in your sidebar (as below). Now, to debug that file, you can use Shift+F9 (the editor must be focused). NOTE: if you want to re-run the last executed file, you can use F11 to debug it (if you haven't configured F11 to always launch the last launch in debug mode, make sure you read the Getting Started on Running a program). When it hits the breakpoint, it will ask you to go to the debug perspective (you should say Yes to this dialog). 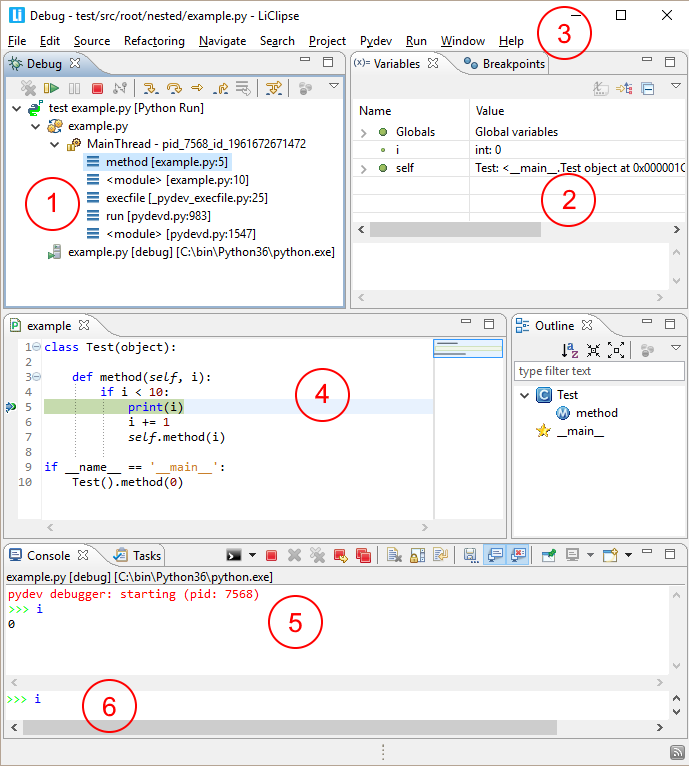 This perspective has the actions needed for debugging and allows you to see the variables and evaluate expressions. 1. Stack view: You can see the variables in previous stacks by clicking on the stack you want to see. 2. Variables view: It allows you to see the globals and locals for the selected stack. 3. 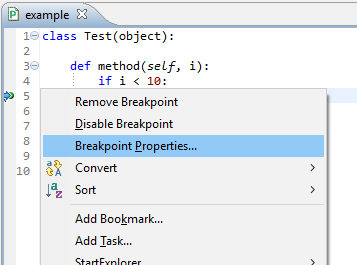 Breakpoints view:Selecting this tab you can see the breakpoints available and enable/disable any breakpoint. 4. 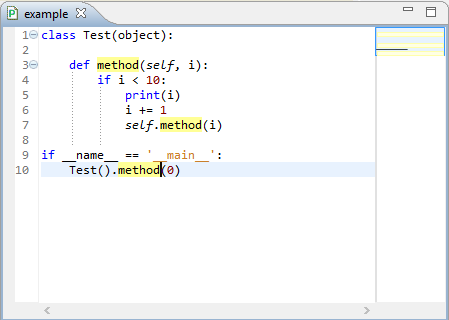 Editor: Shows the code and highlights the line that is about to be executed. 5. 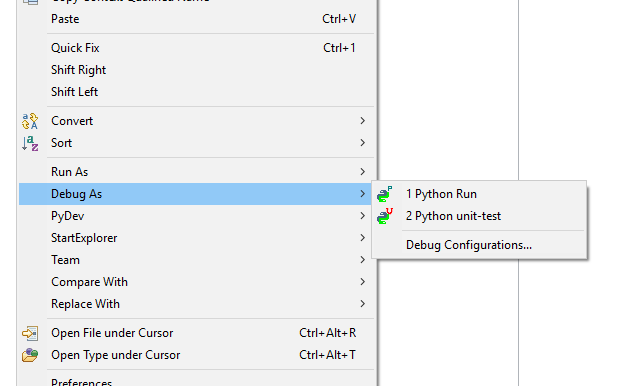 Console: When you run a file through the PyDev debugger, the first thing that appears is a 'pydev debugger' string, to indicate that you're running the file through the debugger. 6. Console evaluation: You can enter commands to be evaluated in the context of the selected stack (1). Set Next Statement: Ctrl+Alt+R (note that it will set the next line to be executed, not run until some line is hit). And you can also add a watch for some expression or make the breakpoint a conditional breakpoint. We'll see how this works below. To evaluate some expression, you can simply select the piece of code you want to evaluate, right-click it and select Watch. Doing so will open a new view that allows you to view the result of evaluating that piece of code in the current context. It allows you to edit some existing watch, add a new one or remove an existing (right clicking it provides all those actions). 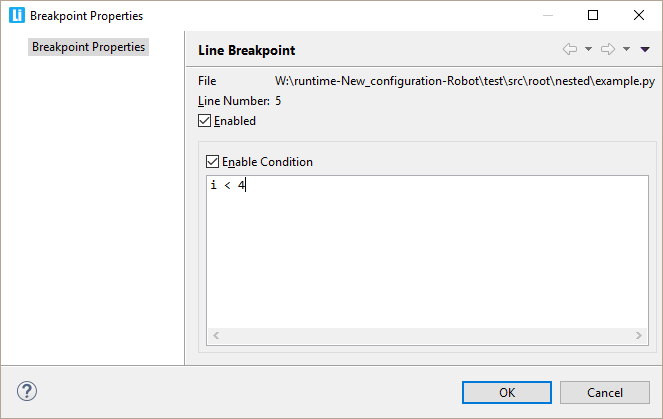 To make some breakpoint a conditional breakpoint, you have to go to some line that already has a breakpoint, open the context menu Ctrl+F10 and select breakpoint properties. Doing that will get you to the breakpoint properties panel, where it's possible to enable some condition for the breakpoint to be hit. So, now, if you resume execution, it will only hit that breakpoint again when the condition is evaluated to True.